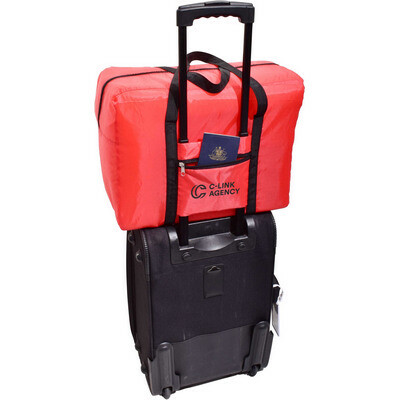 If youve ever run out of luggage space while travelling, then youll absolutely love our latest ultra light-weight Emergency Travel Bag. Supplied folded into its pouch, it measures only 16cm x 17cm and weighs less than 90 grams, yet opens to reveal a large size travel bag measuring 45cm wide x 35cm high x 21cm deep. This ingeniously designed bag fits securely over the handle of your wheeled luggage, and is even able to hold a passport and travel documents in its pouch. Available in a choice of 11 vibrant colours. Folded into pouch 16cm x 17cm, Open 45cm wide x 35cm high x 21cm deep, Weight 86 grams . Bulk Packed. Black, White, Royal Blue, Navy Blue, Light Blue, Purple, Lime Green, Green, Red, Orange, Yellow. Price includes: Printed 1 colour 1 position. Setup is included.